It’s been fun to tease Stuart MacDonald about Tripharbour being his first startup. Stuart is the founder of Expedia.ca, however, it’s hard to compare building a startup with a $400 million marketing budget with the experiences most entrepreneurs have, where they’re lucky if there is budget to hire a marketing person and not just have a couple of engineers doing marketing instead of sleeping. Stuart is getting a taste of the guerilla marketing activities and community building techniques that he has brought to Toronto as speakers at the past 3 Mesh conferences. The management team at Tripharbor includes Stuart MacDonald, Ian Burdett, John Starkey and Pat Perdue. This team is full of ringers. Stuart is the former CMO for Expedia.com. Ian Burdett was a Finance Director at Thomas Cook Canada and Signature Vacations. John Starkey was Director of Biz Dev at Expedia and ran an interactive agency in Vancouver. Pat Perdue was the customer experience manager for Tommy Hilfiger USA and Tommy.com. Great group with strong backgrounds in travel, online retail and marketing. According to Datamonitor, in 2003 the cruise line market segment had a market value of approximately $16.2B and was expected to grow at a compound annual growth rate of 3.8% to just over $19.7B in 2008. This is below the estimated 8% expected market growth, and the “the cruise market is the fastest-growing segment of travel, expanding at 9 per cent a year” according to Stuart MacDonald,. Hmmm, this might be biased in Tripharbour’s favour. However, the cruise industry appears to be growing even as other segments in the travel industry brace for a downturn due to less disposable income related to high gas prices. the 2008 cruise vacationer is upscale (with a median household income of $93,000), educated (69 percent have a college degree) and the median age of cruisers is now 46 years old, down from 49 in 2006, which shows that cruise vacations continue to appeal to younger travelers. The next set of questions are about how and where customers learn about and purchase cruise vacations. The CLIA report indicates that travel agents are best for planning and booking a cruise and travel. comScore reported that online travel spending increased 14% between 2006 and 2007 to $20.3B. Phocuswright is predicting better applications will target the “50+ generation” to encourage online bookings. A review of UK online travel shows that approximately 9% of Internet users book travel online; and an additional 17% research holidays online before booking over the telephone. The NYTimes published that the cruise industry online booking sites are “an exercise in frustration”. This seems to be partially due to the CLIA continuing to support a channel that has withered in other parts of the travel industry. In the same NYTimes article, Terry L. Dale, president of the CLIA, said “because a cruise is a more complex product than a flight or a hotel room, "the cruise industry will always encourage consumers to work with an agent”. It just feels like an industry that is ripe for reinvention, with agent bookings shrinking from over 90% of all cruise bookings to under 75% according to Scott Barry, analyst with Credit First Suisse Boston. Phocuswright estimates that the 2007 US revenues from cruise sales was $13.4 billion with only 7% ($994 million) coming from online bookings. Of the online bookings, approximately 70% ($695.8 million) of purchases were through online travel agencies as opposed to cruise company Web sites. The Tripharbour tools are not as refined as a general travel e-commerce vendor, but they offer a cruise focused purchase experience including the presentation of ship plans and room locations during the checkout process. Tripharbour offers a community driven approach to review and comment on cruises and cruise lines. It will be very interesting to see if Tripharbour can build or leverage social networking tools to increase the conversion rates of users connected by the social graph. Stuart has already mentioned the use of social media to help build a deeper brand experience and to leverage community participation for their burgeoning cruising community. It is still early days on the Tripharbour product and there is a lot of room for improvement. And it will be interesting to see the evolution of both the booking process tools and the continued development of social tools. These tools do not exist and there is an opportunity to define their effectiveness. I love these relatively simple business models. People use Tripharbour.ca to find cruises, people book cruises using Tripharbour, cruise lines pay Tripharbour a commission of between 10% to 17% of the ticket price. The Tripharbour team has 2 main challenges, very similar to the challenges discussed for FreshBooks, reach and conversion. Reach is about capturing the widest swath of cruise purchasers possible. The most common solutions are related to providing great content, strong search engine optimization, and display and search advertising. The Tripharbour team has great depth at both traditional and Internet marketing and advertising and looks to be equipped to adequately monitor and adjust their efforts. The second challenge is conversion. Once potential clients get to one of the Tripharbour sites, getting them to purchase a cruise. A secondary measure is community vibrancy and activity as the creation of cruise related content and connections between members will help improve the content aimed at helping potential customers choice the right trip. Over time an additional metric of loyalty or return rate can be added. Building customer profiling and communication tools to help clients build digital memories, share their experiences, and select more expensive cruises. I have very little understanding of the travel industry. Tripharbour is a member of TICO and CLIA. CLIA = Cruise Line International Association is a cruise line industry association focusing on the growth and promotion of the cruise industry including efforts towards increased safety, reducing environmental impact and regulations. TICO = Travel Industry Council of Ontario is a government mandated organization where membership is required to protect consumers under the Ontario Travel Industry Act, 2002. Tripharbour with membership has joined the association that let’s it legal operate in Ontario and a lobby organization for the industry in which it operates. Good basic, legally required pieces of operating a travel company. Tripgarbour has developed relationships with 12 cruise lines, enabling it to offer cruises in wide variety of world wide locations. 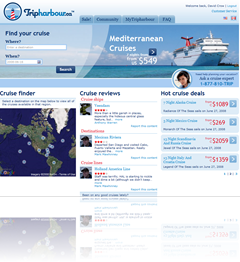 Tripharbour is an indirect sales channel for each of the cruise lines. Traditional competition from big online travel sites including Expedia, Orbitz, and Travelocity and from the cruise lines they are reselling. The majority of the online competitors continued to be focused on working with travel agents including EasyCruise, Galileo. The cruise lines are experimenting with social networking features to help potential customers plan and reivew their offerings. CarnivalConnections.com provides planning, scraplogging, cruise reviews, and message boards focused around the Carnival brand. It is easy for the existing cruise players to build similar community and social features, the advantage that Tripharbour brings is that it’s community is about the cruise lifestyle not a specific cruise line. Tripharbour should be able to build trusted third-party resources and continue to offer price based incentives to cruise shoppers. This is also to evaluate on an industry that I know very little about. All of the barriers to entry analysis appear to provide reasons to not get into the market. Different geographies have different requirements on travel agents and regulated insurance. Tripharbour operates in Ontario and has met the requirements to be a regulated travel agent. Compliance with the regulations is necessary for competitors but it is entirely dependent on their geography. A large experience firm like Expedia may decide to capture the cruise market by decreasing their commission rate and passing the savings along to customers. This could dramatically reduce the prices offered by the competition. Equally, Tripharbour may appear more competitive by reducing the commission fees collected to help differentiate and beat out other players. Again the majority of my arguments should dissuade the Tripharbour team from starting. The advertising budgets, the reach, and the amount of spend by the big players is incredible. However, there is an opportunity in both social media and in a niche market, i.e., cruising, to build a strong highly successful company. The barriers to entry for other participants are not particularly difficult to overcome. However, the experience and focus of the Tripharbour team should provide an advantage in understanding of the current industry including opportunities for partnership, product optimization, and gaps in current strategies. The Tripharbour team is key in differentiating from potential competitors and is a significant barrier to entry for other entrants to overcome. Tripharbour has proven that there is a huge market opportunity in building tools to help sell cruises. There is a huge potential to leverage the social graph to optimize the marketing materials and increase the conversion rates for new purchasers, and to increase the average spend by returning buyers. Figuring out how to leverage social media and users behaviour away from the Tripharbour site may help improve the marketing spend. I wonder when the revenue curve exceeds the expenditure curve. On a small scale, I am assuming that Tripharbour is making money, the question really is how long until it is making more than currently invested, or how much more needs to be spent to gain significantly traction. Tripharbour has a team of online travel industry veterans engaged in building a differentiated product, and refining the marketing tools to increase revenues in a defined and growing market. The question will be how much marketing spend does Stuart and the team need to do to pull users away from the large online travel agencies/portals. Tripharbour is an execution play. The depth of the management team provides a huge strength in being able to deliver a product in a focused industry and effectively market the service to grow revenues. The assumption is that the team can effectively use social media and guerrilla marketing to attract a large enough audience. And that the e-commerce experience and community features will provide the tools necessary to convert members to paying cruisers. As a business analyst, your primary responsibility will be research and discovery that drives business, customer, and technical insight. You will work closely with clients, their customers, and others using interviews, workshops, and other methods to develop understanding of both the big picture and the details. You will use this insight to develop clear vision, requirements, and functional design for client systems. Your work will create the foundation for successful projects, and you will be responsible for activities and deliverables such as documenting requirements, creating process flows, use cases, and reports. You will work closely with others on the team to develop concrete plans and prototypes based on the discovery work conducted by yourself and others. Most importantly, you will work with clients, their users, and nForm colleagues to understand, define, and solve problems to create business and user value through designing fantastic user experiences. Excellent interpersonal skills are required for client-facing engagements. As a boutique firm, you’ll be called on to serve in a variety of roles – flexibility and the ability to tackle new challenges are important. In particular, adopting a value-centered design approach will be important for your ongoing contribution to the company and our clients. Minimum 2+ years of experience dedicated to a business analysis role or similar job function. We will consider candidates with significantly more experience as well. Your portfolio, process, and mindset trump both formal education and previous jobs, though we appreciate good schools and good work.